You lose fat fast with the 100% FDA approved1 non-invasive laser fat loss treatment! At half the Cost of CoolSculpting and treatment in a fraction of the time, you can lose your stomach, waist or love handles during Lunchtime! SEE WHAT , and HAVE TO SAY! Ideal candidates for the SculpSure™ procedure from Fort Lauderdale have extra fat on their abdomen and love handles and are near their correct body weight. SculpSure™ is especially helpful when the fat bulge cannot be reduced by diet and exercise. We always recommend you request a free consultation to discuss what the best option is for your body. Call 561-776-0116 Today for more information. This is what sets SculpSure apart from other treatments like The Venus Freeze, with SculpSure you DO NOT Shrink Fat Cells, you instead cause your body to eliminate them and in a period of 6 weeks to 3 months the damaged fat cells are gone. The beauty of this procedure is that it relies on your body’s natural healing response and is completely non-invasive/ non-surgical. Why Choose SculpSure instead of CoolSculpting™? How many SculpSure™ treatments will I need to get results? 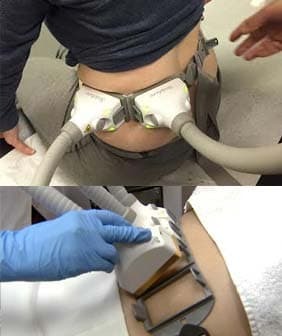 How Much Fat Will SculpSure Remove? Is the SculpSure Procedure Painful? Instead of Diet and Exercise Can I Just Get SculpSure? Want to Finance Your SculpSure with Low Monthly Payments?